POLSON – Adrian McElderry, 32, pleaded not guilty on felony charges of deliberate homicide and tampering with evidence on Thursday in Lake County District Court. McElderry is accused of killing his wife, RaeLynn Charlo, 29, on Nov. 18 in their Charlo residence. According to court documents McElderry reported that Charlo had killed herself through a 911 call to Lake County Dispatch at 5:08 a.m. that morning. When deputies arrived McElderry told investigators that Charlo had been upset with him for drinking and he had been outside in his shop. When he returned to the house, Charlo fired a shot at him and then turned the gun on herself, McElderry said. McElderry claimed he tried to stop Charlo from killing herself. But evidence at the scene didn’t match McElderry’s story. Deputies found a .22 Magnum revolver and several unspent rounds of .22 Magnum ammo covered in blood near Charlo. McElderry became combative, didn’t want to provide deputies with his blood-soaked clothing, and made it so deputies had to get a warrant to continue the investigation. McElderry told investigators he would have gunshot residue on his hands because he had been shooting the gun earlier that evening. McElderry told investigators that he unloaded the .22 revolver after Charlo shot herself and that he didn’t know how bad her injuries were but they didn’t appear to be too severe. McElderry said was buzzed at the time of the incident after drinking half a case of beer, but that he knew what was going on. He said he never fired a gun in the house or at Charlo. He also said neither he nor Charlo had shot a pink rifle that was found by deputies. When detectives told McElderry Charlo’s injuries appeared to be inconsistent with suicide, McElderry told them that she had fired two warning shots – one at him and another into the floor. A bullet hole found in the floor and a bullet recovered from a couch did not match McElderry’s story. Investigators found that one bullet was fired upward from about two feet off the floor above where Charlo’s body was located. An open rifle case was found on top of a blood spatter with a bit of blood inside the case. The rifle that McElderry said neither he nor Charlo had used was found with blood inside its action and on the ammunition found in the gun. Neighbors interviewed by deputies said McElderry and Charlo had been screaming at each other loudly at around 1p.m. The neighbors said they thought they heard furniture being moved around loudly at one point. Bail was not set in the case. McElderry faces the death penalty or life in prison for the deliberate homicide charges. Tampering with evidence carries a maximum sentence of 10 years in prison. He could also be fined up to $50,000. 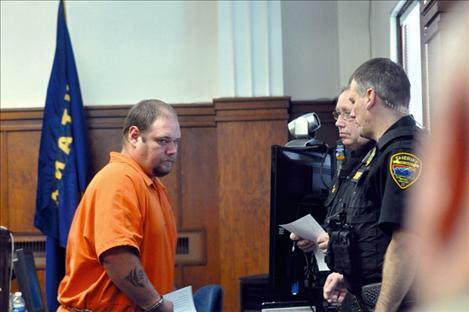 A jury trial was set for March 9, 2015. An omnibus hearing was set for Jan. 15, 2015.